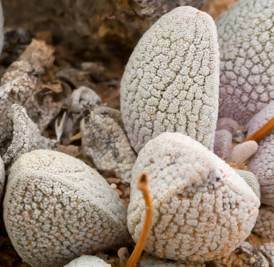 A diminutive and attractive grey-leaved succulent that is easy to grow and makes a great pot plant. 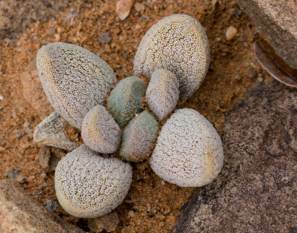 This curious dwarf species is somewhat more succulent than other members of the genus Crassula. It adopts a curious survival strategy by camouflaging itself with a rough, white, frosty coating on its leaves that not only allows it to effectively blend in with its gravelly environment but also makes it somewhat unpalatable to animals. Crassula tecta is a perennial succulent, branching from the base, forming a dense rosette of highly succulent leaves reaching a height of about 50 mm. 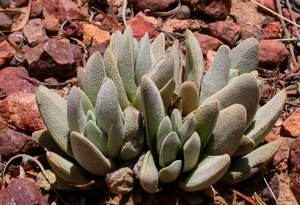 The leaves of all Crassula species are typically opposite and stacked at right angles to the pair above and below, and although not always obvious, this is also true of C. tecta. Unique to the genus, the leaves of this species are covered in white papillae giving them a grey or whitish appearance. They are essentially slightly flattened oblong cylinders with blunt rounded tips. In the eastern end of its distribution the leaves are more flattened and are keeled along the edge and tip. The thin fibrous semi-succulent stem is short and gives way to a shortly branched root system well adapted to growing in very shallow soils. Flowers are tiny, white, 5-petalled cups, each petal 3-4 mm long and recurved at the tip, and the anthers are yellow. Flowers are borne as a dense glomerule or rounded cluster on an elongated peduncle 30-80 mm tall. Plants in the wild usually have only one glomerule per peduncle, but plants in cultivation can sometimes exhibit up to 3 clusters. Tiny fruits consist usually of 5 ± separate parts (follicles) which after a month or so after flowering dry to release the minute dust-like seeds which are dispersed by wind and water. It is not known how long-lived these plants are in the wild but, considering the relatively slow growth rate, estimates would be in the region of 3-7 years, perhaps longer if conditions are favourable. This plant is considered not to be rare in any way and has a status of Least Concern. 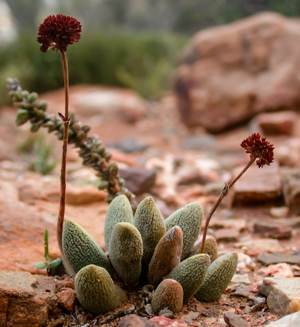 Crassula tecta is an endemic to the winter-rainfall lowland plains of the Little Karoo. It is not common but occasionally occurs in relatively dense stands, always in shallow gritty soils in full sun between exposed bedrock, usually shale, and sometimes, but not always, associated with white quartzite pebbles, amongst which it is very well camouflaged. 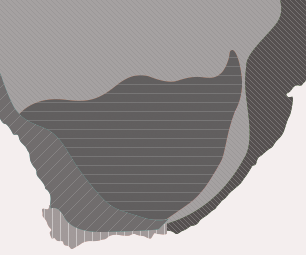 Its distribution extends from Montagu in the west through Oudtshoorn and as far east as Steytlerville. The name Crassula literally means 'little fat one'. The specific name tecta refers to the way the leaves cover one another, much like overlapping tiles. 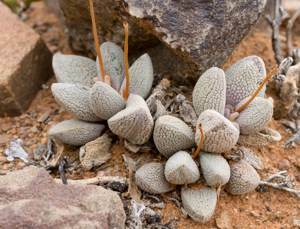 Not much is known about the ecology of this plant, apart from the fact that it grows brazenly out in the open, away from the protection of larger shrubs and in full sun, which is unusual for dwarf unarmed succulents. The white papillae which cover the leaf surface give it a quartzitic stone-like appearance and render it virtually invisible to passing predators. The white papillae also act as a sunscreen reflecting most of the sun's harsh radiation, serving both to protect the leaf tissue from harmful UV rays but also to prevent the leaf from getting excessively hot, much like some cacti which are covered in white wool-like hairs. There are no known cultural uses for this plant. Crassulas are amongst the easiest plants to cultivate, and this species, although once considered difficult and rare, is actually easy and rewarding to grow. The code to success is well-drained gritty soil with a low organic content, with good ventilation and bright light being essential. Being a dwarf novelty plant, it is recommended to cultivate this species in a pot rather than in the open soil. A window sill receiving full sun is ideal, but they can also be grown outdoors in the full sun. Water sparsely throughout the year but only when the plant becomes soft to the touch. Although this species is resilient in cultivation, overwatering will result in obese and unattractive plants and also makes them more susceptible to fungal attacks which result in leaf scarring or rotting. Feeding is not necessary and will only cause lush growth which will ruin the characteristic nature of the plant. Propagation is easiest from cuttings, especially leaf cuttings, at any time of the year which means they can be bulked up very easily. Remove the largest outermost leaves by pulling them away and to the side, tearing them gently away from the stem. A powdered rooting hormone for softwood cuttings can be applied at this point but is not at all essential. Allow the leaves to stand for a few hours so the wound can dry and heal. Insert them into a dry gritty growing medium with the bottom third of the leaf buried below the soil surface. Do not water the plants at this stage but rather keep the pot dry and in a bright situation out of direct sunlight where they will not get any water. After a week, they could receive a light sprinkling of water. Rooting should take place within 2 weeks. Once the leaf cuttings have visibly plumped up, move them to a sunny spot, and within a few months young plantlets will develop from the base of each leaf, eventually forming small rosettes. Crassula tecta is also easily grown from seed which should be sown in autumn. 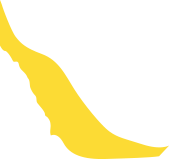 Fresh seed has the highest viability and is thus recommended. Mix the dust-like seed with a small quantity of fine sand. Spread the sand evenly over the surface of the growing medium. Water immediately, preferably from below by standing the pot in a tray of water every few days. Keep the soil moist like this for the first month or so. Before long, tiny green plantlets should appear on the soil surface. Start to let the soil dry out between waterings. Soon the plants will bulk up, and if one achieves the ideal growing conditions, one can raise many thousands of plants like this. The use of a damping-off fungicide is advisable. Rather err on the side of caution and keep the plants too dry than too wet, this will result in neat, healthy and attractive plants. Even though they naturally receive rainfall only in winter, in cultivation they can be given water at any time of the year.